Just a bit of clearing up of past matters. First of all, apologies for the delay of the post on Saturday night – which to be honest was more a relief to get the last of January’s millstones put to bed. This was caused by something to do with the scheduler here having a little funny turn, and one of us discovering the next morning when they logged in to get the Bear Mountain Creations and NRaas Industries posts prepared that the post from the previous night had not appeared! Still, it was nice to see for once that we could make a contentious post without us having to take cover from the people involved launching a salvo of spat dummies at us. But then despite the name, the residents of Crazy Town do tend to be a little more mentally stable than certain elements elsewhere around the Simmerverse, as anyone that experienced ‘Black January’ will testify. The only real aftermath to it was Zhivan – now he’d been unmasked – went back to his trademark Simself avatar when he joined Bear Mountain Creations, making Figwit swoon in the process, but that’s another story! Back in January, we got a message from Zhivan that there appeared to have been someone interfering with his account at Snooty Sims. We said to him at the time that a number of people and places had suffered from idiots attacking forum accounts, hotmail accounts, etc; although the fact it occured just after Zhivan had his own run in with some of the locals did make us wonder. Then about a week ago without warning, LadyEmillye’s account there was deleted from Snooty Sims without any explanation whatsoever given. It certainly wasn’t the case that she’d posted anything contentious – she’s never posted there at all! But remembering what Zhivan told us, we warned both him and a number of others we knew were there as to what happened – saying we were going to get in touch with Snooty directly to let him know something untoward was going on with his own forum and with any luck things would be looked into. We could have used the PM system, but Snooty for reasons best known to himself now forwards any such missives that are meant to read only by him instead to Kira and Erhama to deal with – both about as much use as a one-legged man in an arse kicking contest if it isn’t anything to do with aiding one of their ‘besties’. Guessing he’d probably also done the same to the e-mail address he’s posted on the front page of the site, and determined to deal with the organ grinder and not the monkeys that couldn’t give a monkey’s, we used the gifting system at EA to warn him what had just happened. Yes, within hours what was also erased was our account there that’s been around ever since the days of the Maddy444 vs Comrade Rich affair (and which always made us laugh when people said they’d no way of contacting us directly when there was one for all the world to see since 2009, and which Maddy444 had certainly blabbed off to enough folk about! ), again with no e-mail of explanation given. We contacted Snooty yet again to let him know we’d been the latest, and guess what – no reply! Now it could be that by a remarkable coincidence the phantom hacker of old Snooty Town managed to get our account. Or that Snooty decided to kill the messenger in a panic at the possibility of word getting out amongst the Snooties that their accounts there aren’t secure as they think. However, considering that Snooty has never replied to our missive to date, it appears either he or more than likely one of his two pet poison toads Kira or Erhama (after he passed it to them) did so out of spite from being mega-butthurt over the ProfPlumbob’s Coconut Island article walking the ghosts of the disgraceful treatment of Sharkloverplayer last year, Erhama’s anti-Semitic posts and the various other public relations disasters that are all part and parcel of the ‘experience’ on that forum that go all the way to explaining why a site that gets thousands of visitors daily is lucky to get ten visiting its forum – five of them being search engine bots. Forget the fact, even if it is true, that we plugged two separate island projects over on their forum in the space of a few days that got them a few new active members to piss off in due course as per usual – something they may have noticed no other forum or blog bothered or bothers to do precisely because of where it was being hosted. Yeah, truth hurts Marcel old bean! 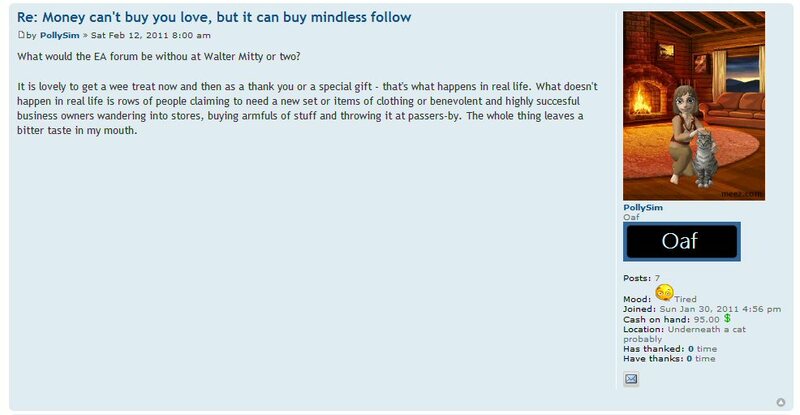 Old Snooty’s suddenly taken it upon himself to post an awful lot on the EA forum nowadays in a transparant bid to get more members. Here’s a tip Marcel – stop letting there be one law for Kira and her spoilt teen brats mates and one for everyone else because watching over your own forum’s too much like bloody hard work. Then you might keep some new blood instead of them lasting about a month tops before getting pissed off and joining Crazy Town, Simpletons, etc, etc. for some more civilised company. If that sounds harsh, here’s a point to ponder. When Snooty Sims posted on its front page about our bit about Olympic Physique, we were taking 500 hits a day just from that link. So why wasn’t that 500 hits for us translating into anything equivalent in terms of members posting on their forum a day? And finally, we’ve saved the worst till last. Yes, it did come to our notice that like a bad boxer, she refused to stay on the canvas, and decided to do one last bit of bumnuggetry that may have major reprecussions. Since the wheels are now turning, we feel free to comment further. Over on Simpletons, they’ve been discussing the latest idiotic part of the affair, as Crazycatldy explains. Yes, you read Crazycatldy right – Alexbutthurt claims to be taking a lawsuit against EA games for having the audacity to ban her from their own forum. Secondly she posted up what she claimed to be access into our account on the EA forum as some sort of hare-brained ‘proof’ that we had a vendetta against her. Now one of the two things she posted to ‘prove’ she was telling the truth (and she’s been such a paragon of truth and integrity up until now…) was simply what links had been saved using that account, some dating back to plumbob knows when about all sorts – none incidentally concerning her, but never mind! Far from being the big scary hacker she was trying to make herself out to be, all she did was in fact a rather simple trick anyone can do using the EA forum: go to your bookmarks, alter the page number of the URL, and you can see what someone else has bookmarked: hardly the work of a computer genius. Of slightly more concern was a post that looked – or was meant to look – like an EA forum Administrator’s admin functions page. Now it could have been a fake (after all, how many of you know what they look like? ), or it could have been a certain moderator we’ve had a run in with of late sent Alexurt a screenshot of her being in our account to use as some sort of childish attempt at intimidating use (they really don’t know us very well, do they?!). Or Alexbutthurt’s found a new glitch to exploit. 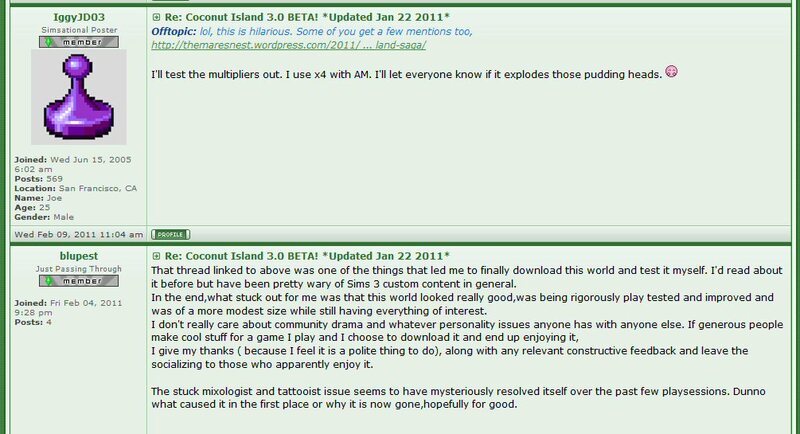 Either way, it represented potentially a very serious breech of the EA Sims 3 forums already over-compromised security over the last year. Now having put up the post, Alexbutthurt took it down PDQ, barfing about being the bigger person, but our guess is that Blunote00 had warned her the implications of what she’d just done, especially in the light of her hare-brained lawsuit. There is such a thing as web archiving and caching sites, and thanks to them we retrieved the said offending post thanks to an old friend and forwarded the link both to EA Customer Services and to one of the Sim Gurus so they’d know what was going on. We got two replies in due course, the second stating that it had been passed onto senior staff, so if certain individuals find themselves in a whole lotta soapy bubble with EA’s legal department as a result, you’ve only yourselves to blame. As we said from the beginning, we found ourselves being reluctantly pulled into this whole business, and it proved that our distaste of the whole ‘gifters’ and their buying of friends was well founded. We’ll leave it to one of Simpletons latest recruits, Pollysim (hmmm, the ex-Jazz Handers are rather thick on the ground of late – like the buses, none for ages and then three at once!) – the latest to succumb to the irresistable charms of their animated avatars with purr-monsters in them – to sum up exactly our own feelings on the matter. This entry was posted on February 16, 2011 at 10:49 pm and is filed under Uncategorized. You can follow any responses to this entry through the RSS 2.0 feed. Both comments and pings are currently closed.